We have been sparing no effort to create a happy learning environment, but many parents amplified the concept of “happy”—they thought that in that mode, their children didn’t need to learn, or didn’t have to spend time or effort in it; they held that happiness was the supreme idea for growth of children, and children’s freedom couldn’t be limited by any norms. As a result, children lost all the happiness of learning instead. Self-cultivation knows no national boundaries. No matter how maverick children are, it is not contradictory to let them comply with the rules, and to be polite and gracious. So, is “happy learning’ equal to “easy learning”? Is “students’ burden reduction” unique to China? No, the developed countries are also conducting it, and they even face more drastic education reform. American schools are not that relaxing, let alone describing them as an amusement paradise without homework. Many students in good schools of America often do their homework until midnight with the help of parents, and American parents may wish to apply for school burden reduction more eagerly. An American parent had wrote a widely-reposted article complaining how the overloaded schoolwork deprived his child’s sleep and imposed high pressure on the child; however, he had no choice but to let his child redouble efforts to be competitive in the current society. Some net friends commented: this is talking about China! We do not deny that the teaching model and teaching style of foreign schools are different from that of domestic schools; however, no school at any country always treats students as kindergarten children and indulges them to play every day. Even the UK, a country with rich education resources, is still attempting educational reform. BBC has filmed a documentary about a middle school in the UK inviting Chinese teachers to conduct experimental teaching of Chinese-style. They thought that in recent years, their children are slowly losing their advantages in international competition. In addition, the UK is one of the most demanding and efficient countries in terms of secondary and higher education in the world. Many advertisements also promote learning foreign languages, music, dance, and art with happiness and ease. How many parents rush for it? If one likes to play basketball, he/she must bear high-intensity physical training. 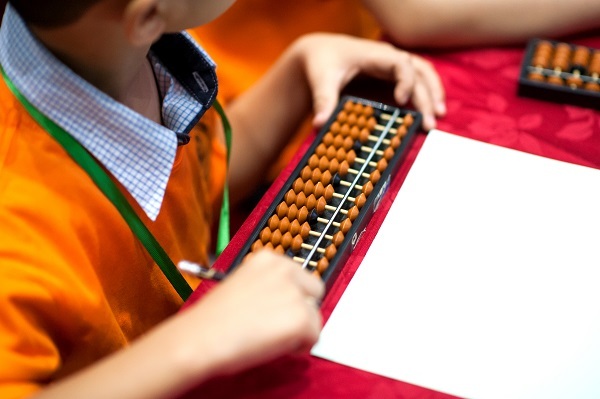 Abacus mental math can help one solve math problems quickly, but to gain number sense, it also needs perseverance. Reciting words is necessary for English learning—and more importantly, it needs long-term use and practice. Just think, as the mother tongue, Chinese language courses are opened from primary school to university, so how can we think that a foreign language can be easily grasped? Practicing painting and calligraphy needs hard work—to practice skills on one hand, and to cultivate mind on the other hand. We must accept that—when proceeding to a certain extent, learning will enter the bottleneck stage, in which you will feel “not so happy”; however, this stage is more important to learning, which can not only consolidate knowledge, but also practice mind and learning abilities. We have published an article called “GRID, the most critical key to success” that talked about the concept found by most of the advanced Western countries: GRID, namely, perseverance, is the most critical quality for success as well as one of the most valuable qualities in education. The importance of this quality is much higher than that of EQ, IQ and so on. It is true that there is no special way to let anyone grasp a knowledge or skill quickly, so how about ease and happiness promised originally? Happiness and perseverance are not contradictory; instead, happiness is the reward of perseverance. Someone ever put forward “success brings pleasure”. When you make great efforts and succeed, you will have a sense of accomplishment, which makes you happy. So, where is the happy class from? First of all, the teacher’s respect for children is the fundamental of learning. Equality, respect, trust, appreciation, focus, and encouragement are the core concepts of Shenmo, among which respect constitutes the basis of children’s happy learning. After all, education is the exchange and communication between people; those obtaining respect and recognition can continuously make progress; to avoid overemphasizing the results or horizontally comparing children can always let children feel free, and then they can enjoy the process of acquiring knowledge. In addition, happiness is also derived from overcoming difficulties, especially from the sense of accomplishment after the success of self-challenge. It seems to be a contradiction—difficulties bring you not happiness but suffering; however, once you overcome the difficulties and make achievements, you will feel the happiness of harvest; if you choose to escape from it or give it up, you will not only miss the happiness of making progress, but also produce the shadow of failure, as well as the fear of difficulties; therefore, some children are increasingly happy in learning, while some other children are more and more painful. The key is determination and perseverance, so it can be said that: those brave to challenge difficulties and having perseverance are always happy. In fact, no one can learn a variety of skills happily; on the contrary, their happiness is from pains and gains. In addition to teachers’ diligent teaching and guidance, the encouragement and support of parents are more important for creating a happy classroom. A family with positive environment in which it encourages perseverance and challenges is of great benefit to happy learning of children in real sense.